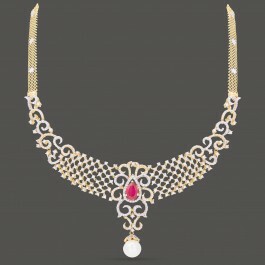 Ornately crafted 22k yellow gold necklace and ear-drops set ornamented with round brilliant diamonds, ruby, emerald and pearls. The descending order chain embossed with little florets and awesome pendant dangler. This makes a Phenomenal look!